The Genomic Research Laboratory is devoted to the investigation of mechanisms underlying Staphylococcus aureus biofilm formation, intracellular survival and antibiotic resistance using genomic technologies such as microarrays, high-throughput sequencing, bioinformatics and genetic screens.The Genomic Research Laboratory is also actively involved in the development of methods in metagenomics and their application for medical research and diagnosis. 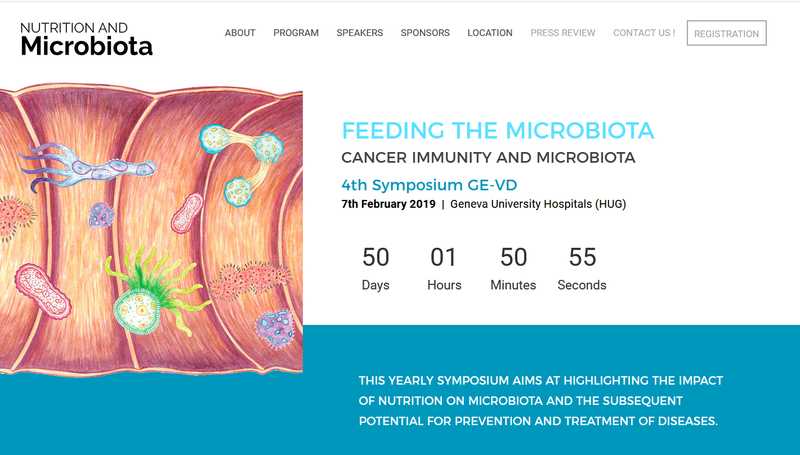 Discover the 4th symposium on : Cancer Immunity and Microbiota organized by Nutrition and Microbiota, which will be held on the 7th of February 2019 at Geneva University Hospitals (HUG). This special afternoon will focus on the impact of gut microbiota on health and disease. It aims to inform a wide audience (doctors, nutritionists, biologists, bio-informaticians, students, nurses, private companies) about the innovations in the field and the impact of nutrition on microbiota. A better understanding of the association between nutrition and gut microbiota could open up new therapeutic options for chronic diseases such as cancer. If you are interested in this event please register for free by clicking the button below. Or, by gaining resistance to antibiotics, such as glycopeptides or methicillin. Our team tries to elucidate these mechanisms by using a genomic approach (microarrays, genotyping, etc.). The setting-up of a research team dedicated to the genomic of prokaryotes (computer scientists, biologists, physicians, technologists). The design, manufacturing and validation of a genome-wide S.aureus oligoarray. This achievement will provide important synergies between our groups involved in bioinformatics, genomics, genetics and microbial physiology (association with Kelley and Vaudaux laboratories). The significance of our platform and research group is illustrated by numerous national and international collaborations with entities as diverse as the CHUV (University Hospitals of Vaud canton - Lausanne), the EPFL (Federal Institute of Technologies in Lausanne). Collaborations have been established with the following scientists: in Switzerland (Profs B. Berger-Baechi, T. Calandra, T. Egli, J. Frey, U. Jenal, T. Lasser, P. Linder, Ph. Moreillon, J C. Piffaretti) and in other countries (Prof. D. Mack, Swansea, Wales; Prof. I. Toth, Dundee, Scotland ; Prof. D. Raoult, Marseille, France ; Prof J. Etienne, Lyon, France ; Prof. Y. Le Loir, Rennes, France; Profs S. Engelmann et M. Hecker, Greifswald, Germany ; Prof. M.G. Pinho, Portugal; Prof. A Bayer, Los Angeles, USA; Prof. R Proctor, Madison, USA, Dr L. Louie Toronto, Canada; etc..). The Genomic Research Laboratory routinely collaborates with various research and diagnostic companies including: Abbott, Agilent, Applied Biosystems, BioMérieux, Bruker, Cepheid, Roche, etc… as well as various start-up companies: Fasteris, BioCartis, Spinomix. Our research is supported by competitive grants obtained from the Swiss National Science Foundation (projects on S. aureus biofilms; antibiotic resistance; virulence and genome evolution), the program COST (project COST B28) as well as different research programs from the European Community (MagRSA, MOSAR, SATURN).